Imaging In Italy - Guided photo tours of Rome, Florence and Venice : Florence is the birthplace of the Renaissance. Let our professional photographer show you the best vantage-points to make stunning photos of the extraordinary city, with the Duomo, David Statue, and Ponte Vecchio. Florence is the birthplace of the Renaissance and is perhaps one of the most visited cities in the world. Our photographer will show you Ponte Vecchio, Piazza Signoria, Palazzo Vecchio, Il Duomo, The Doors of Paradise, the Arno River, famous statues of the Loggia, and panoramas of Florence. Below are some of the extraordinary places you will see and photograph. The Duomo (S. Maria del Fiore) was begun in 1296 by Arnolfo di Cambio on site of the old church of S. Reparata and took 150 years to complete. The enourmus dome was designed by Brunelleschi, winner of a public competition, who developed a new building method creating one of the greatest engineering results of all the times which is now one of the symbols of Florence in the world. Attached to the Duomo is the Campanile di Giotto.Widely regarded as the finest in Italy, it is a superb example of Italian Gothic architecture. Building started in 1334 by Giotto and after the artist's death several years later, it was finally completed in 1359 by Francesco Talenti. Standing at almost 85 metres / 275 feet high. Nearby we'll see the Battistero Di San Giovanni. Built between 1059 and 1128,and remodeled on an earlier Baptistery built in the 5th or 6th century, is one of the oldest buildings in Florence, and was for a long time believed to have been an original roman temple dedicated to the god Mars. 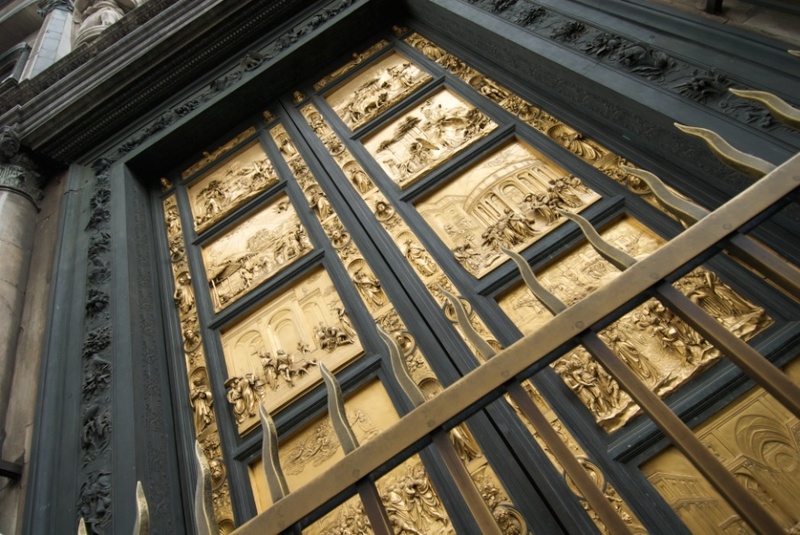 The building is famous for its bronze doors, which many art historians say mark the birth of the Renaissance, believed by many to have begun in 1411 by Lorenzo Ghiberti. 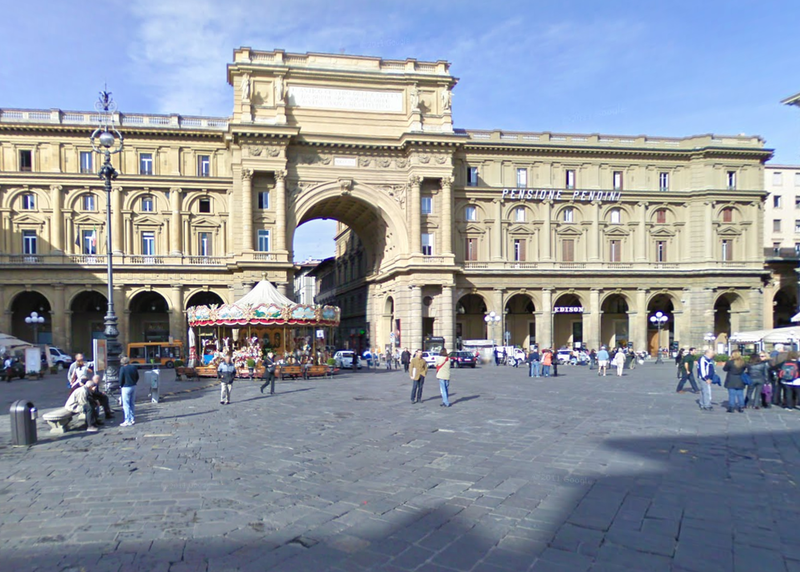 Piazza Signoria has been the heart of Florence since the 15th century. and the central point of the political life through the centuries. Dominated by Palazzo Vecchio with its commanding view of Florence and the Arno River that winds lazily through city, the fortresslike city hall and the huge Fountain of Neptune by Ammannati make a grand open air museum of monumental marble statues and one of the most elegant collections of sculptures in the world, Piazza Signoria has been the heart of Florence since the 15th century. Ponte Vecchio is Florence's most famous bridge. Built in 1345, the Ponte Vecchio is the oldest bridge in Florence and spans the River Arno. This three-arched bridge was the only one in the city to survive the bombings in World War II, and is lined with shops, mainly gold and silversmiths, making this a popular shopping area. There is a secret passageway high above the shops, the Corrodoio Vasariano, that links the Uffizi Gallery to the Pitti Palace, that was originally built so that the wealthy Medici family could walk into town in private. The Basilica di San Lorenzo is one of the largest churches of Florence, situated at the centre of the city’s main market district, and the burial place of all the principal members of the Medici family from Cosimo il Vecchio to Cosimo III. It is one of several churches that claim to be the oldest in Florence; when it was consecrated in 393. San Lorenzo was also the parish church of the Medici family. Orsanmichele has a long story: originally a grain market became a church at the end of XIV century, after the arcades were closed and two additional stories added; the statues on the exterior are copies and represent the work of many Renaissance artists, while the originals are in museums. Repubblica Square marks the site of the ancient forum, the core of the original Roman settlement and, now home of Florence most fashionable and expensive cafés like Paszkowsky and still the center of the life in the town. Santissima Annunziata Square is considered one of the most beautiful squares of Florence with its Renaissance lines like the Ospedale degli Innocenti portico designed by Brunelleschi in the beginning of XV century. The north side of the square is framed by the Santissima Annunziata church, a parish church founded in 1250 by the Servite order. Santa Trinita Bridge was built in its elegant curves by Ammannati in XVI century, probably using Michelangelo’s drawings, but was rebuilt in 1952, using again the original stones, after being destroyed during World War II.